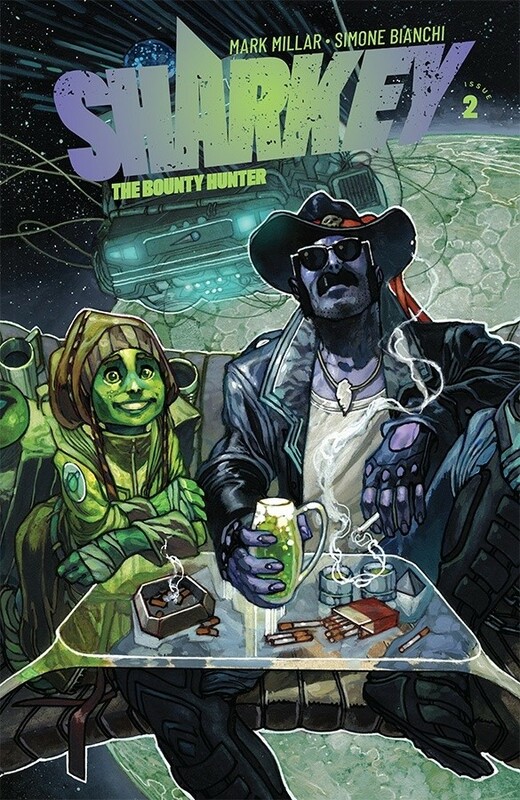 Sharkey the Bounty Hunter #2 Review: Prey for a day – AiPT! This issue is lost in a sea of cliches. Mark Millar can’t stop cranking out series now that he’s partnered with Netflix. Unfortunately, although better than his recent Prodigy series, Sharkey isn’t exactly watertight. This issue focuses on the quirky dynamic of Sharkey having to cart around Extra Billy, the son of a wanted criminal Sharkey killed. And…it’s exactly what anybody would picture with that setup. No more, no less. Extra Billy says/does something cute. Sharkey gets angry, but not too angry. Rinse, repeat. It’s not badly written, but it lacks an edge or emotional pull that Mark Millar usually brings to his titles. The host of other bounty hunters vying for the same goals as Sharkey are memorable. However, there are too many of them vying for time. The scifi universe here is mildly interesting, but nothing special. Many of the designs and locations come across as unused Star Wars Prequel material. Simone Bianchi is certainly a capable artist. That being said, he doesn’t give much attention to scale, which restricts the worldbuilding. Even if the concepts aren’t terribly original, letting us bask in the world would have helped. Lacking an edge or emotional pull, Sharkey #2 is lost in a sea of cliches. Art fails to display scale/scope.